The mercury test measures the mercury blood level. A mercury test measures the mercury blood level. Why is a mercury blood test important? The mercury test is important because mercury toxicity can cause damaging symptoms in the body. This Mercury Test is a blood test. The mercury test, also known as a mercury lab test, mercury level test, mercury poisoning test and mercury toxicity test, measures the mercury blood level. Mercury is an element and heavy metal with a wide range of industrial and environmental uses. Sometimes referred to as quicksilver, mercury is used in common devices like thermometers, manometers and fluorescent lamps. Unfortunately, mercury is also quite toxic and mercury poisoning can occur from ingesting, inhaling, or touching mercury or its derivatives. Mercury poisoning occurs from mercury exposure. People may be inadvertently exposed to mercury from industrial, dietary or environmental sources. Typically, mercury exposures that lead to toxic blood levels typically originate from old dental fillings, certain types of fish, and industrial exposure in the workplace. Symptomatically, mercury can lead to neurological symptoms such as weakness and numbness, memory loss, and sensory difficulties. While mercury levels clear relatively quickly in the blood, mercury testing can be helpful for diagnosing organic mercury poisoning. No fasting is required when getting a mercury lab test. To get a mercury test near you, simply order online and get your blood drawn at the Quest Diagnostics lab you chose. 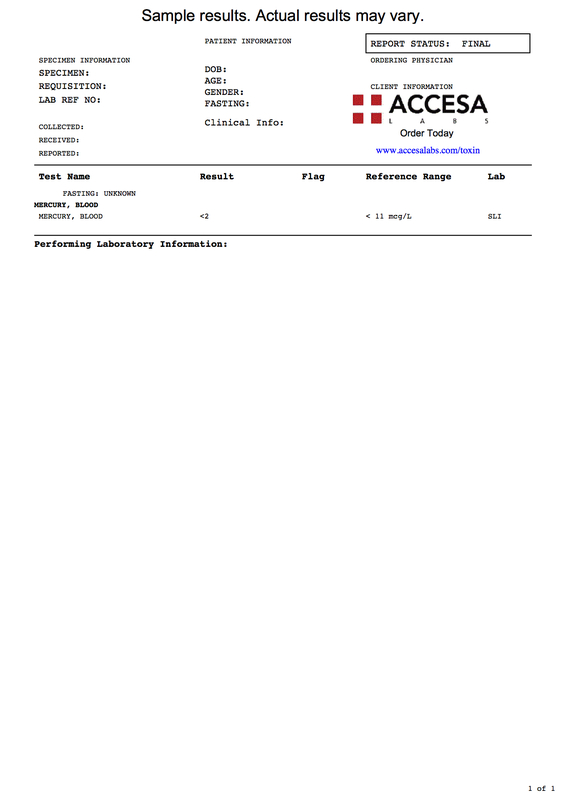 Once your mercury lab results are ready, they will be available for download. As can be seen on the sample mercury blood test lab report above, the results are reported as a number and can be compared against the reference range provided by the lab. Frequently, the mercury test is ordered with the lead test for a wider metal toxicity screening. The mercury test is a component of the toxin panel test. Mercury Test at Guaranteed Prices.